A Pu-erh normally can be reviewed from five aspects: dry appearance, liquor color, aroma, taste, and wet leaves and choose on that basis. Dry Appearance - Leaves of a dry storage Pu-erh are tight and heavy and have blooming color. Leaves of a wet storage Pu-erh, on the other hand, are loose and have dull color. 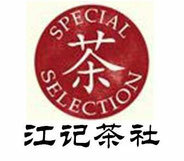 Liquor - Liquor of an aged dry storage Pu-erh is in bright chestnut red color. Liquor of a 8-10 years or older Pu-erh is in oily deep chestnut color and has a golden ring . Liquor of wet storage Pu-erh is in dull chestnut red or soy sauce black color, has no golden ring, and looks muddy. Aroma - Pu-erh can have many different aroma. Good quality Pu-erh may have orchid, lotus, camphor tree or stale flavor aroma. Low quality Pu-erh may have moldy, rotten wood aroma. Unlike Tie Guan Yin or Dan Cong tea, the aroma of Pu-erh lies in the liquor, hides at the bottom of the tea cup. Therefore, one way to enjoy the aroma of a Pu-erh is to smell the emptied tea cup after first infusion. Taste - An aged dry storage Pu-erh tastes mellow and smooth. The smooth taste is like that of drinking soy milk. Brewed Wet Leaves - Wet leave colors change from green (new tea) to yellow then chestnut red (aged). 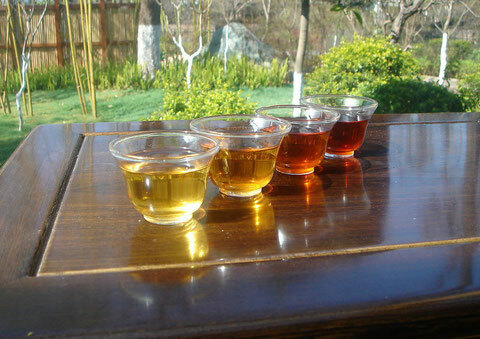 However, wet leave color along can not be used to judge a Pu-erh's age. The texture of wet leaves should also be considered. Wet leaves of dry storage Pu-erh are soft, flexible and not rotten. Wet leaves of wet storage Pu-er are in dark chestnut red or black color, and are fragile.